I love side projects. It’s fun to dive into an idea, make it happen, then share it with the world. I also love the term side project because it sets reachable expectations. It also means there is room for more than one. Yet, there is not unlimited room. At some point a side project needs to move on, away from its creators care. The majority of a side project’s life is spent in either maintenance or decline. 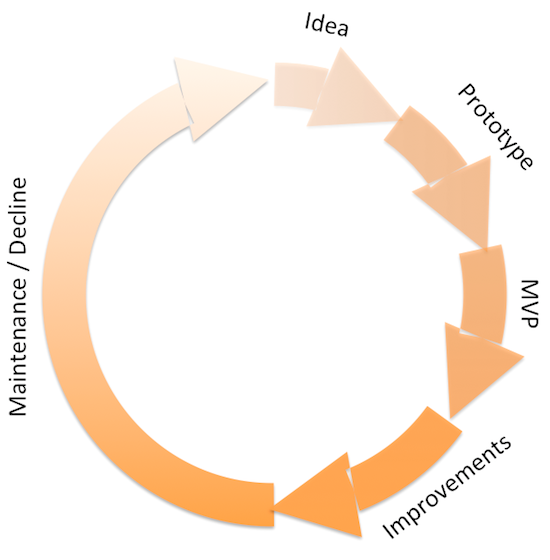 All the fun of a project is in the early half of the lifecycle. That’s where the creative energy is bursting, propelling through to MVP (remember when to buy the domain name). Sometimes that activity carries on through the improvements part of the cycle. Rarely, you can extend that section, if you really have a lot of interest. Most commonly, side projects enter maintenance or decline. No matter which it is, they don’t have the same vigor as the earlier stages. Maintenance and decline take time or energy (usually both) from the new projects you want to build. Ever since I left ProgrammableWeb, I’ve wanted to dive deep into just the subset of public APIs that every developer needs to know. These are the APIs that fulfill a purpose beyond supporting an application or service. The API is the service. EveryDeveloper launched in early March, gaining a lot of interest. I’ve been keeping the fire stoked (improvements stage) since, exploring related topics on its blog and on Medium. I have written about several side projects on this blog over the years. One that got a lot of attention was a site to help find WiFi in coffee shops and other public spaces. 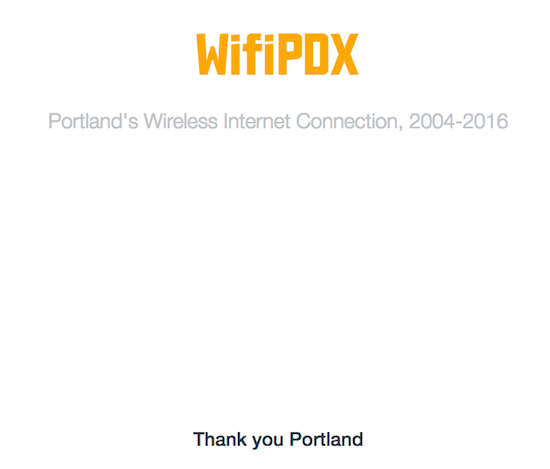 WifiPDX launched in 2004, when there were only 54 spots in Portland to find WiFi. Now, of course, it’s practically ubiquitous. Though I relaunched in 2012 that was basically the last time I made any improvements to the site. I did little maintenance over the last four years, but not for lack of need. Spam listings and reviews littered every page. The design wasn’t responsive, which made it very difficult to use on mobile devices (which is now likely the primary use case). Most importantly, I’m no longer interested in taking it on as a project. To make room for EveryDeveloper, and whatever else I may do next, wifipdx.com now has a simple epitaph on the home page. And all pages redirect to it. This side project has completed the entire lifecycle. The prospect of making this decision was sad, but making it was exhilarating. I felt the energy release, no longer held by WifiPDX’s needs. After 12 years, it’s time to make room for something else. No, this isn’t a post about a New Year’s resolution, though what I say here will significantly impact this upcoming year. No, despite the typical career transition sentiment of my headline, I am not leaving Orchestrate, the awesome company where I have worked since May to make developers more productive and creative. This will be a personal post on what is still, according to the domain name, a personal website. Seven and one-half years ago, I made a commitment to you. I made a commitment to my country. At a time when most were announcing two years in advance of inauguration day, I put my name on the line. On July 4, 2007, I started my campaign for president of the United States. For 2016. A lot has changed since then. 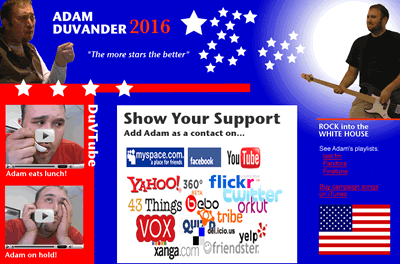 Most of the social networks on my campaign website are out of business or shadows of their formal selves. A lot has also changed with me, but you wouldn’t know it from looking at this site, which again purports to be a personal website. In 2008, I decided to stop programming and start writing about programming. 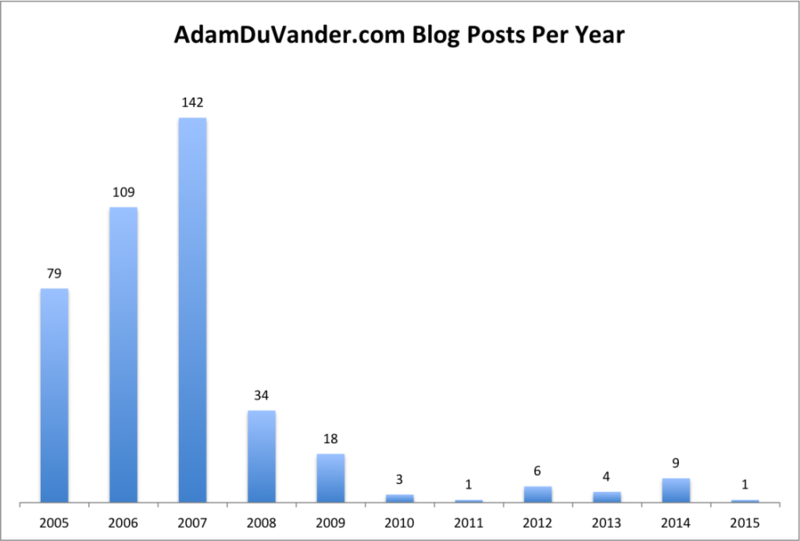 In essence, I became a professional blogger. And I’ve been one ever since. Webmonkey, Wired, and ProgrammableWeb were all clearly blogging gigs. My last two roles, at SendGrid and now Orchestrate, there’s a lot more to it… but the blog has factored in pretty heavily. It used to be I would write blog posts on this site with care. Sometimes I would include hand-crafted charts, like above. I would write about personal news and not just insights that fit the Simplicity Rules® theme. Professional blogging and personal blogging are about as similar as cheddar cheese and head cheese. In ignoring the personal side of this personal site, I have let major life developments go without coverage. I got married. In 2009. I am a father. We had twins, but they’re over two years old now. I am impressed by my good friend Jacob, who blogged a two word entry about his son well before Gibson’s first birthday. The post headline begins, “a couple months ago,” which is itself commentary on today’s social web. As the headline suggests, I am going to spend more time with my family. For politicians, this typically means leaving office. For me, I won’t ever get there: I am suspending my campaign for president of the United States. I am so thankful to have incredible support from my family: my wife Jenny, son Evan, daughter Alana and the new baby I am extremely excited to meet in June. What? You didn’t think I was just going to post that on Facebook, did you? By the way, to get back to the non-personal topics for which this blog is known, this post is an excellent example of burying the lead. 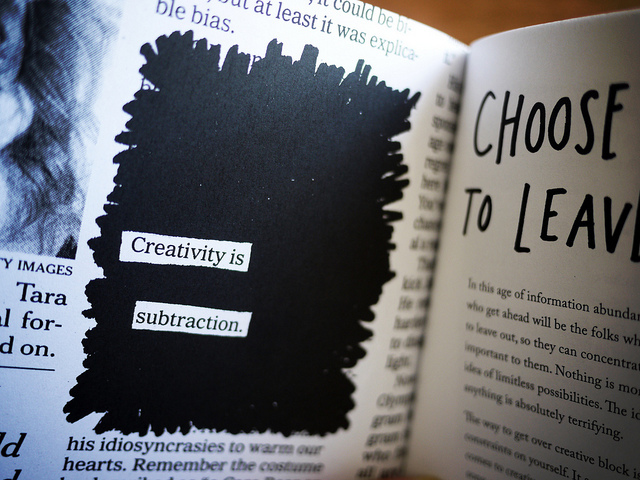 Kleon has used subtraction—literally—in his own art. He wrote a book and maintains a website with poetry based on newspapers redacted, much like the image above. Using a black Sharpie, he subtracts the words he doesn’t want, uncovering a poem that was always there, unseen. Similarly, the Laws of Simplicity boil down to subtraction. What can you take away from your work and still have it feel complete? What can you take away from your process that inspires entirely new types of work? I’m a fan of time-boxing techniques for creating constraints that encourage me to get things done. The POWER HOUR, for example, has been in my arsenal since 2005, though I don’t use it every day. That’s great for personal productivity, but what about when it comes to motivating toward the same end? Now I’m going to try something similar, but with my growing developer relations team at Orchestrate. This week we’ll be on an all-company retreat, where among the outcomes I want is a plan for the next 100 days. Using Freedman’s approach the deadline comes first. Whatever the developer relations team will accomplish during this timeframe will happen by September 9. 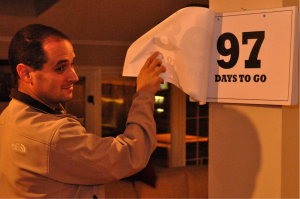 Determining what fits into those 100 days is the hard part. And we’ll be using some of those precious days to figure it out, likely walking back and forth on the two simplicity paths until we find the right balance. As Freedman suggests: be ambitious, but do away with wouldn’t-it-be-cool-ifs. Then we’ll start again. What are your 100 day goals? Our own personal stories tend to make sense in retrospect. There may be plot twists that at the time cause a little confusion, but then it all sorts out into a tale that seems predictable in hindsight. That’s how I feel today as I join Orchestrate to start a developer relations team. It was tough to leave SendGrid, a fast-growing developer-focused company that I’ve respected since my days as an API journalist. I had a good year working across multiple teams and learned a lot. Most of all I’ll miss the great people, but I know I made a lot of lifelong friends there. Plus, this world of developer relations is not very big and there still aren’t very many “B2D” (business to developer) companies, so I expect our paths to cross often. And this post marks the third time I’ve written about this new job. On the Orchestrate blog I explained why I’m joining and at PIE (an incubator where I first met the founders) I talk about my earlier mentorship role in the company. From the plot twist of 2008, when I moved from programming to writing about programming, each additional career move seems to have led to this role. Even this site, started in 2004, feels like part of the story–Orchestrate simplifies databases so developers can focus on what separates their story from everyone else. There’s a lot of work to be completed on this next chapter, but it’s a draft I’m excited to write.